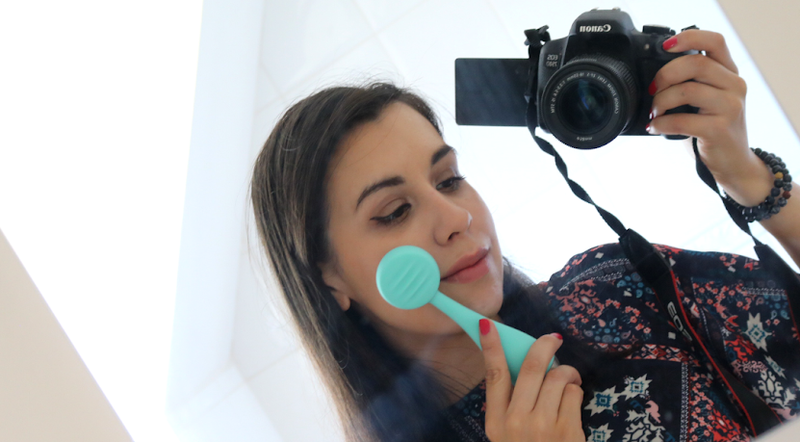 Something a little different for my Mid-Week Pamper Treat today as it's not technically a 'beauty' product, but more of a wellbeing/relaxing treat for tired eyes. Whether you're in the middle of a busy week or you've been spending too much time looking at screens (I know the feeling all too well! 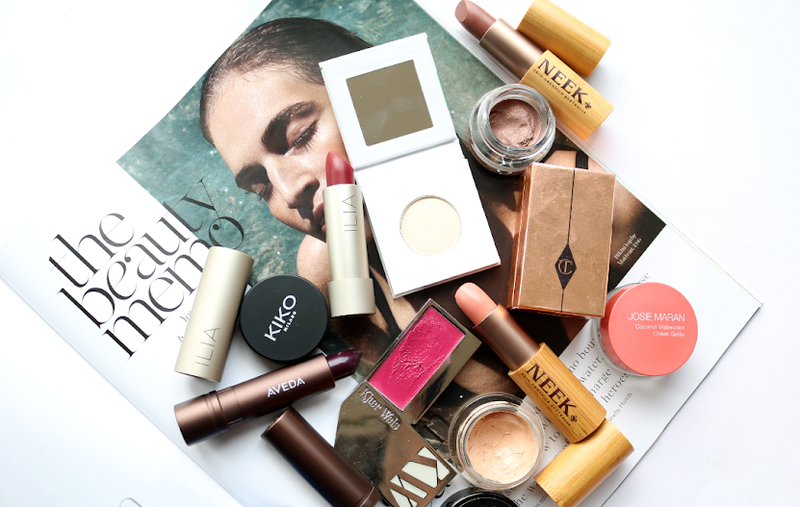 ), chances are you could benefit from a little 'me time' right about now. This brand new product from Optrex, (those specialist eyecare people who answered the prayers of everyone who can't/won't use eye drops with their clever misting spray - than you! 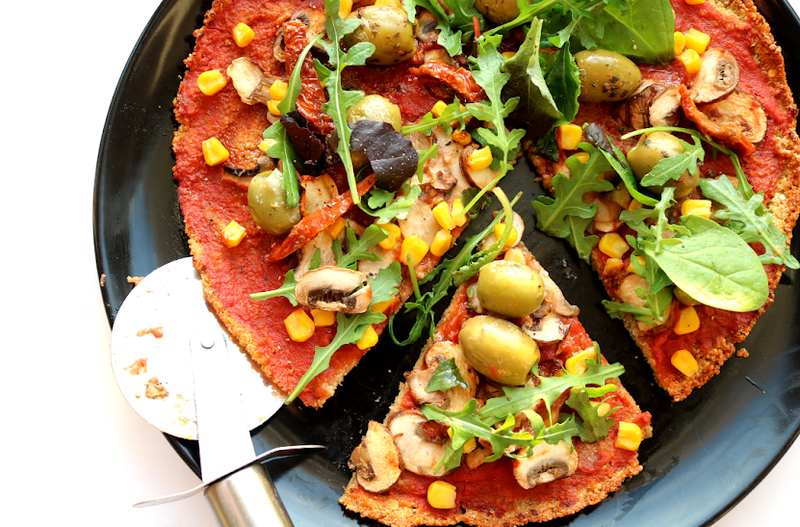 ), landed on my doorstep the other week and I was very intrigued to try it out. 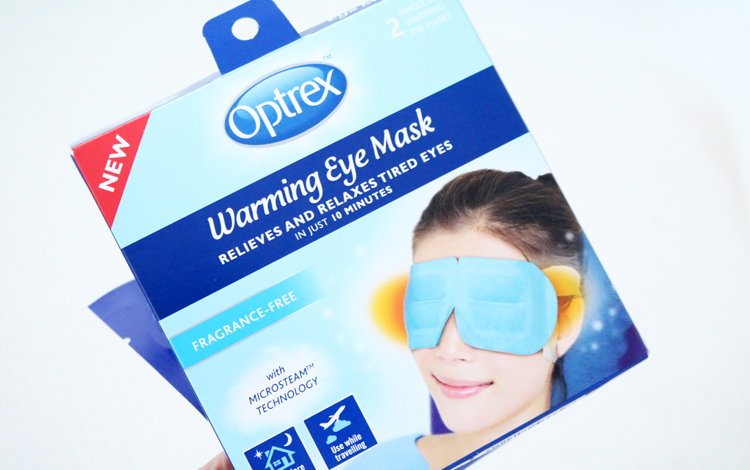 Optrex Warming Eye Mask is a self-heating, disposable eye mask with Microsteam technology. Its aim is to moisten and soothe tired eyes within 10 minutes by using this innovative Microsteam technology which creates a gentle, warming sensation. So this isn't a skincare product? As mentioned above, this isn't a 'beauty' product as such as it doesn't have any skincare benefits for the eyes. Think of it more as a general wellbeing/relaxing/pampering treat instead. Each mask is single use and comes in its own sachet. 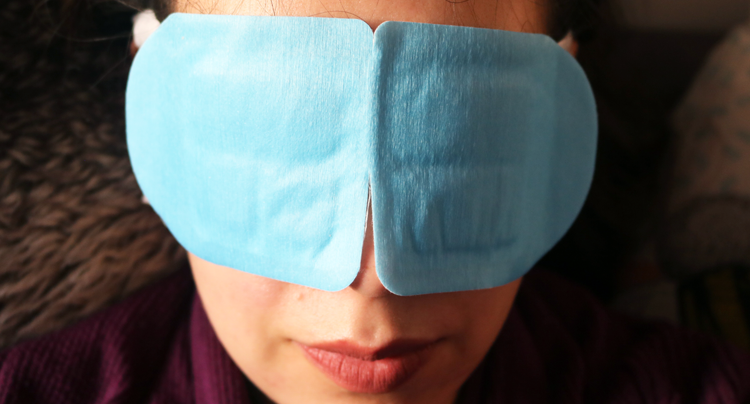 When you open up the sachet, the eye mask self-activates and starts to warm up. This takes around 3-5 minutes, so there's plenty of time for you relax, find somewhere comfortable to sit/lie down etc, before you use it. 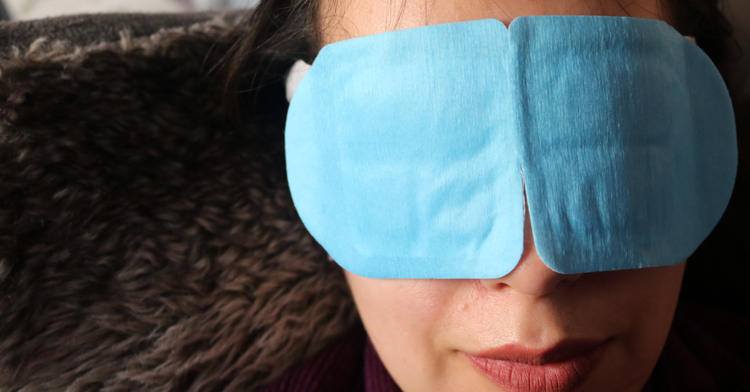 When you're ready, simply place the eye mask over your closed eyes and use the attached stretchy bands to wrap around your ears. Relax and enjoy the warming effect for 10 minutes. There's even a special playlist that you can listen to here. I wasn't quite sure what to expect as for some reason I imagined steam to start appearing, but it doesn't work like that. Instead, the microsteam is fully contained within the main part of the eye mask and just heats it up. It feels warm, comforting and totally relaxing. The mask was still warm after 10 minutes, so I left it on for another 10 until it started to gradually cool down. 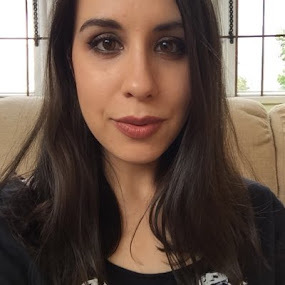 Afterwards, my eyes felt refreshed and revitalised, and I felt thoroughly relaxed. I can imagine using these on a regular basis and they would be great for travelling with, especially on a plane. P.S: Yes it does look like a bit like a sanitary towel, but I'm so chilled out right now that I just don't care! 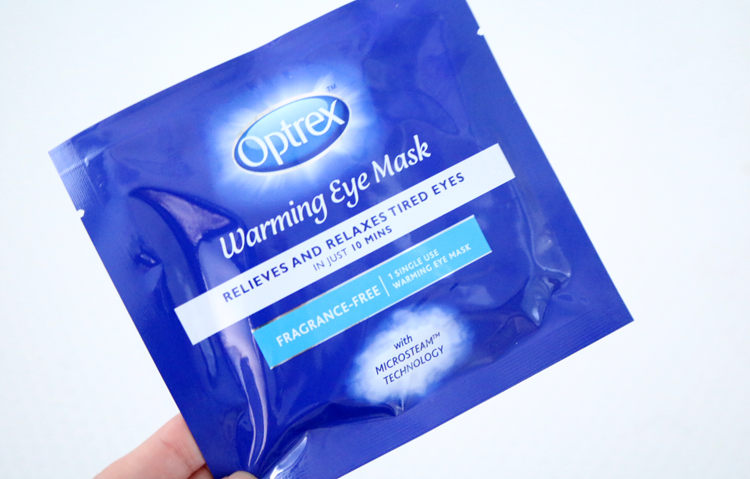 Optrex Warming Eye Mask* is sold in packs of 2 for £3.99 or a pack of 8 for £9.99, available from Boots and selected pharmacies nationwide. I've reviewed the Fragrance-free one above, but there's also a Lavender scented one available which is exclusive to Boots.